Strawberry-Tomato Soup with Broiled Chicken infused with an Espresso-Kosher Salt Rub! – Cooking with Gabi – all about integrating Fruits & Vegetables into your daily diet! ← Early Saturday Breakfast: Strawberry & Muenster Cheese Mini Sandwiches! 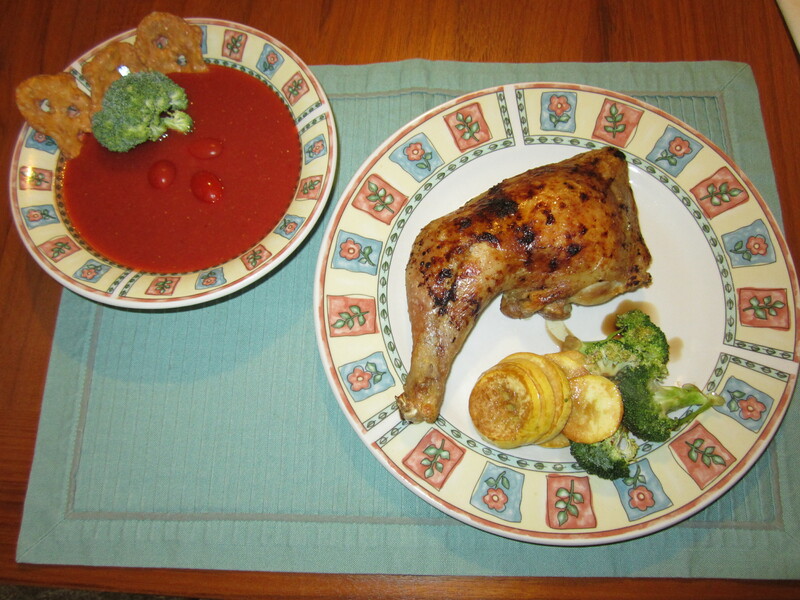 Strawberry-Tomato Soup with Broiled Chicken infused with an Espresso-Kosher Salt Rub! Remember that awesome tomato soup I made on Friday afternoon? For a special Sunday lunch, I took one pound of fresh, bright red strawberries and pureed them with 1/3 cup of the awesome tomato soup, and placed it to chill in the freezer. I adorned it with some grape tomatoes, broccoli and three Awesome Garlic Parmesan Pretzel Crisps, made by Snack Factory. These chips are totally awesome…and go so well with strawberry-tomato soup, which by the way could be enjoyed before, during or after lunch! The light garlicky tomato soup, accentuated with the pureed strawberries made my taste buds feel like they were at a disco! So much flavor dancing all over my tongue….severe yum factor! Had chicken in the fridge, so out it came…and unbeknownst to me, opening my cupboard I reached for the espresso….even though it did not seem to make any sense, I took kosher salt and therefore created my first espresso and kosher salt rub for chicken. Let me tell you….the awesome perfume of espresso with chicken wafted throughout my kitchen, making me salivate, as I waited for it to cook. Zucchini and broccoli, lightly tossed with a just a tablespoon of extra virgin olive oil, really good balsamic vinegar and kosher salt made a great side dish. Try this recipe out and let me know what you think!!!! SO EXCITING THAT THIS HAS BEEN FRESHLY PRESSED!!!!! This entry was posted in broccoli, chicken, strawberries, tomato soup. Bookmark the permalink.